I meant to get to this post last week, sorry for leaving you all hanging! I was all ready to shoot some photos of my flower boxes and my neighbor Linda’s (more on that in a minute) when Michigan had to get all confused and think it was winter for a minute again. I planted 12 flats of flowers and the temps immediately dropped and we had frost advisories 2 nights in a row, what’s up with that Michigan? Cue me breaking into panic mode and finding every old sheet and towel in the house to then rig up weird covers hanging out all my windows. Anyways the freeze is over (hopefully! 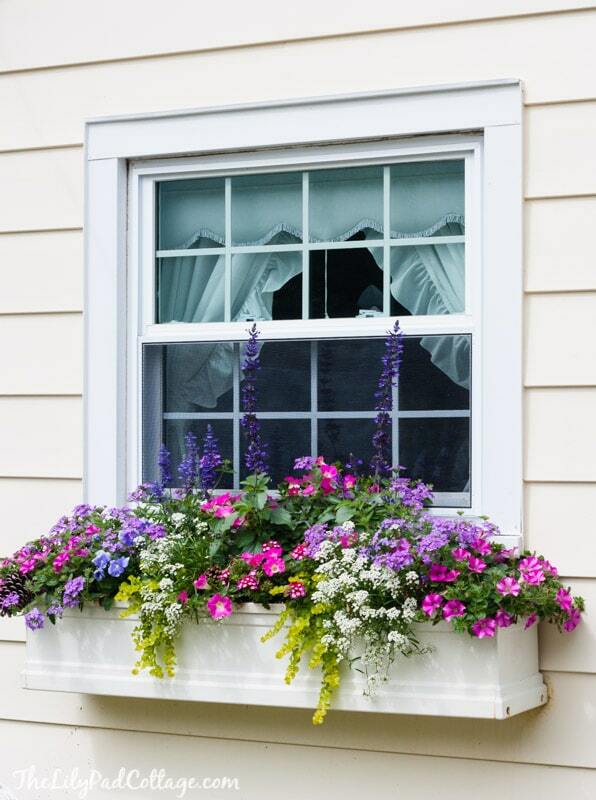 ), we are finally warming up here and I’m ready to share my 5 tips for Gorgeous Window Boxes! This is my 4th year planting my window boxes and every year I’ve tried something a little different, hoping to hit on just the right mix. Every year I aspire to be like my neighbor from down the street, Linda. She has the most gorgeous window boxes I have ever seen! I totally drool over them every time I walk by with Buddy, while he is busy barking his fool head off at Linda’s sweet springer spaniels. This is only 2 weeks in on the planting season and they already look amazing. Don’t worry, I’ll show you some photos later in the summer when they are really in full bloom. 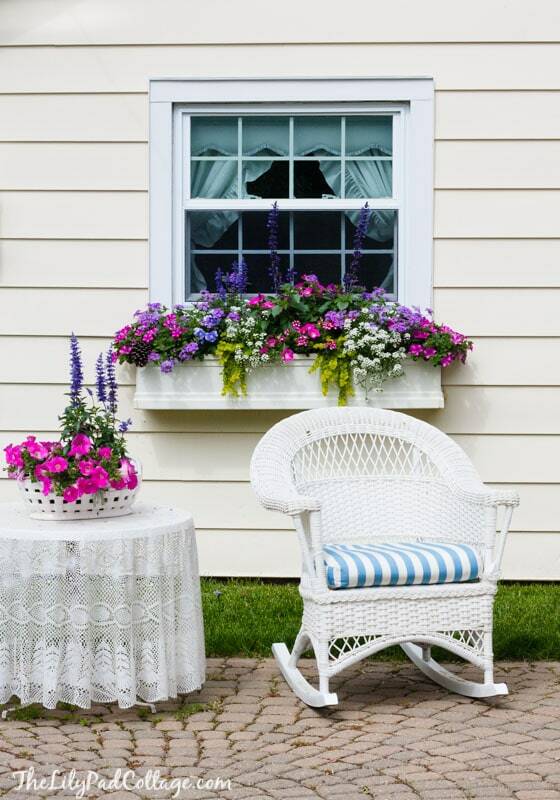 I love this sweet little spot in their front yard, from the striped cushions the lace tablecloth, its just perfection. 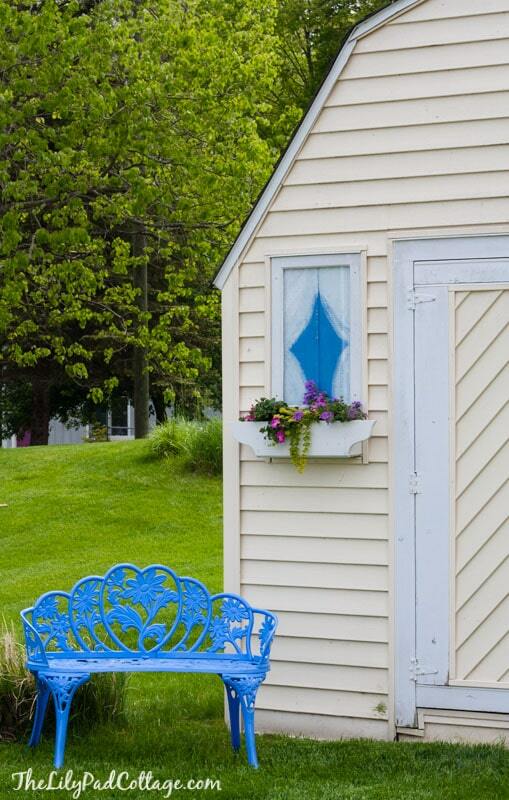 Oh and let’s talk about how even her cute little garden shed has a “window box” – love it! I asked Linda some of her tips, because the first year my boxes looked pitiful. I felt like I had baby window boxes that just wanted to be like hers when they grew up. I also threw a few tips in that I have discovered thru trial and error too. TIP 1 : Start with good potting mix in your boxes. I don’t totally refill them every summer, because there is usually a lot of good soil left in them at the end of the season. I just churn up the old soil and add in the new and give it a good mix. 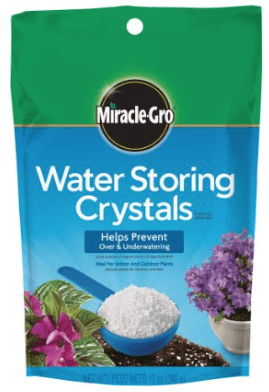 TIP 2: While you are mixing up that soil add these water storing crystals to the mix. These little things are a life saver! They absorb water and turn into clear jello looking blobs and hold the water in and slowly release it as needed. 4 of my flower boxes are on our 2nd story and it is a pain to hang out the window and water them every day, these allow me to skip that chore more often. TIP 3: Fertilize, fertilize, fertilize! 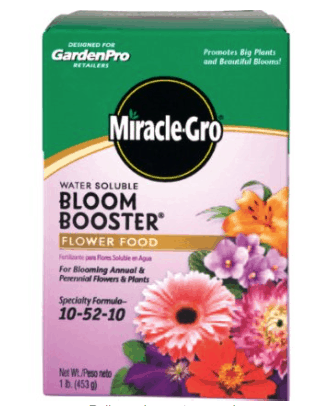 I use Miracle Gro Bloom Booster once a week (promise this is not an ad for miracle gro I just love the stuff). I could never figure out why my flowers didn’t get nice and full like Linda’s until she shared this tip with me. TIP 4: Fill those boxes up! Ignore all the advice of the flower flats suggesting to space them so far from each other etc…I did that my first year and they looked so skimpy and never really filled in. You really want nice full boxes, I think I put almost a whole flat into each of my larger boxes. TIP 5: Plant the right flowers for your space. You gotta think a little bit about your windows, sun vs shade, colors etc..
Linda’s boxes get plenty of sun all day and her windows open up, so she can do a beautiful mix of verbena, petunias, and white snow mountains. My windows on the lake side get full sun beating down on them all day long and petunias seem to be the only flower that can stand up to the heat. My windows also open out, so I need to plant lower trailing flowers, nothing tall or I decapitate them when I try to water them out my window. This year I’m trying something different and doing all petunias in bright pinks and purples, this is what they look like after surviving the frost. I’ve realized over the past few years that if I plant a beautiful mix like Linda in my 2nd story windows you can’t really see them from the ground. I’m hoping the big mass of bright colors will really be visible from out on the lake. Oh and if you have been hanging out here since last summer, you will notice our metal roof is finally done above! I’ll be back later in the week sharing updated photos of the outside of the completed sunroom, that I never got the chance to share. Back to the flowers, last year I did a mix of shady and sunny flowers, because we cut down some trees and I wasn’t sure how that would affect the light they got and ended up with this – which I loved, but the impatiens got taller than I expected and it was nearly impossible to open our windows. let’s see how all petunias works out for me! Beautiful. I love the pink and purple together. I struggle with what to plant in my containers on my porch because it’s shaded all day until afternoon and then the sun really beats down on it. I’m definitely going to try your tips. I agree with adding good soil. I have a friend who has a yard that looks like a magazine cover and she told me if you want beautiful flowers start with the best soil. Thanks Becky, shade is so hard! I always go to impatiens and ferns for the shade. Completely charming and utterly delightful! Awesome tips! Living in Alberta certainly can bring snow or frost warnings at this time of the year so I can certainly relate. I too have window boxes and cram in as many flowers as I can as well just in case some wither away on me lol! Love your style, and the lake is picture perfect. Thanks so much Anita! Hope it warms up by you sooN! Love your petunias! It seems that they are pretty heat tolerant in Fl. too! Miss all the other annuals you could plant in the northern states. I plant mostly heat tolerant perennials here too. Wish I could plant window boxes on my bay window out front. But, my neighbors would start calling me a Yankee! (I’m from Ohio), I will just have to keep coming back to your house to admire all the beautiful thinks you plant this year! Plant whatever you want! (From one yanke to another; I have lived in Fl for 38 years)! beautiful and thank you for the tips. Could you please list all of the flowers in Linda’s window box? Hi Liz, she used verbena, petunias, smaller bell petunias (I think they are called super bells sometimes) and snow mountain. Also I believe a variety of sweet potato vine. Hello, I am a window box admirer! I have vinyl siding and worry about securing a box on our home. My husband is not convinced it is a good idea, is it possible? Looks like I see some vinyl siding in your pics. Thanks, looks gorgeous! Hmmm, we have faux cedar shake siding not sure if it is really considered vinyl but ours our screwed right into the siding? Not sure if that helps?! We have siding and my husband made window boxes from cedar wood. He had wooden braces underneath . It was about 1″ thick in s shape, two for small window and 3 for larger box. Made out of the same wood. I painted them to match the shutters. They’ve been up for 25 yrs. and still look great. I placed liners inside the boxes due to watering all the time. He used screws to hold better. Hope this helps ! I live in Ohio where it’s always cold and snowy, short summers. 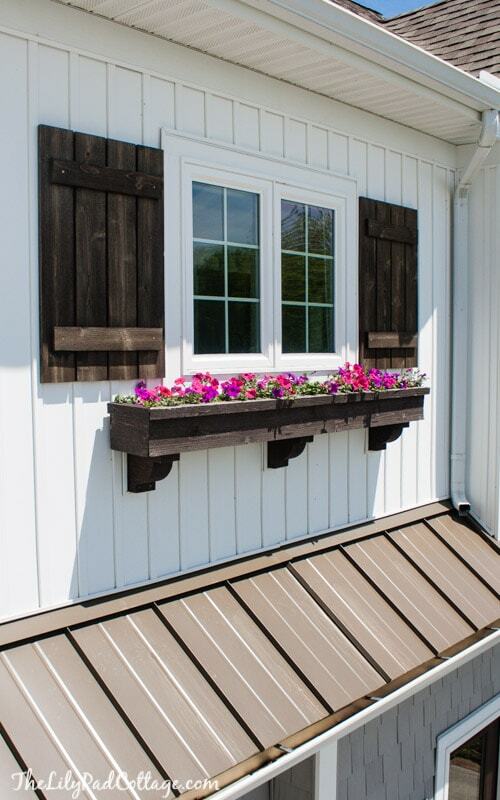 I have window boxes that my husband made and attached to vinyl siding. No problems. You just make sure you secure it with long screws into the siding through to the wood 2×4’s of your structure. I’ve had them for 16 years and never once had a problem with them falling or coming loose. I do not have braces below them, either. I load them up with flowers and dirt. Thanks for the great tips, Kelly. Mine always seem to look pretty pitiful by the middle of summer. But I ‘ve used geranium’s, so that could be the culprit. Going to try your tips and your neighbors flowers. Ha my Mr. know nothing about flowers! I dunno I always jam them in there and they seem to do great! Hi Kelly. Always look forward to getting your emails. I’m in No Illinois and our weather is pretty much the same as yours. I noticed in the pictures, the table had a lace cloth on it. Does she leave that outside in the elements of foes she take it inside and cushions also. Your home is beautiful !! Yes she leaves it out in the rain and it still looks beautiful! I’m guessing she washes it every once in a while to keep it looking nice. 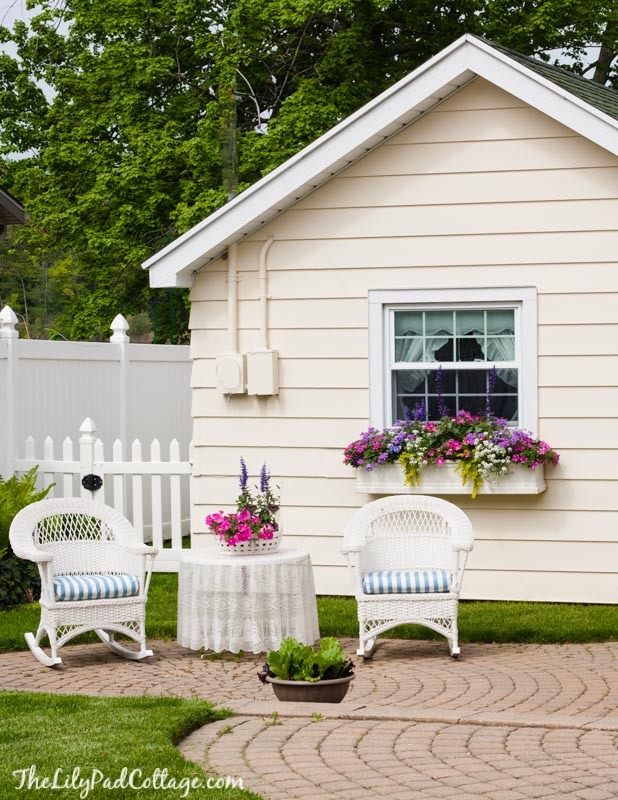 She has the cutest little patio out front there! 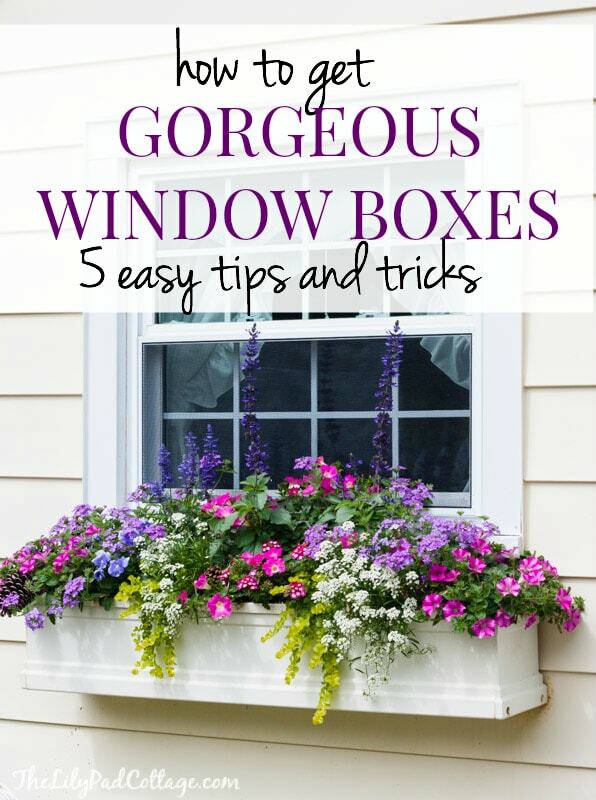 Another great tip-, gardeners supply catalog sells a great watering system for second floor windows.. My neighbor has gorgeous boxes because you only need to fill a couple times a week.. Her boxes are gorgeous and watered with this great system..,check it out. 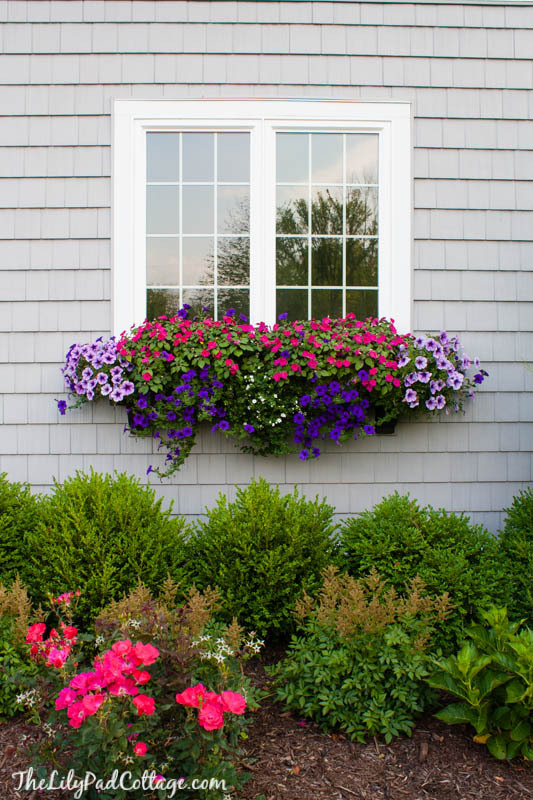 Hi do you know which watering system your neighbor uses for the second floor window boxes? Sorry forgot to mention it’s called the self watering planter.. It’s available in different colors or you can drop into your own flower box. Really works.. I totally need to check this out, thanks Maggie! Thanks Janie, so far they are working great! Hopefully I didn’t overplant too much I really stuffed them this year! Thanks Great advice! I love Petunias and they smell good too! I used to use a vine, it was a small light green tiny little pearl shaped leaves that grew and hung down so beautiful and I cant remember the name or find them anymore. They would look great in your boxes! As usual love everything! Oh I also love the metal roof! Tell me do you have a source for where you got the metal? We are wanting to do just our porch overhand. A smaller area Thanks so much, and your writings about your Bratwurst finger made me blow coffee on my screen! LOL Toodles! Thanks Dixie, I did vines one year in my boxes and they took over everything! My flower boxes are really shallow and don’t handle lots of roots well I guess. Our metal roof is just from a local lumber yard, I’m sure if you contacted a roofing company to do it they could show you all sorts of options! The description doesn’t sound like vine but like creeping jenny, which is very limey green, almost yellow and will fall over the side of pots.very good and decorative in containers! Totally hardy perennial. I live in Amsterdam and in the north of England, where my garden is. In Amsterdam now, so pics will have to wait. I’m 59 and ne ver had à Nice box of flowers yet. I would liked to know exact l’y what potting mix you use. I use the miracle gro brand! I have also tried petunias, but dead heading becomes a chore. Do you dead head yours? Is there a variety that doesn’t require that? Also, what are those purple spikes in the back? Thanks. Hoping my box thrives this year with your suggestions. Great tips! I have 12!!! Window boxes on the railing of my wrap around porch!!!! I definitely don’t feed them weekly so will try that this year. Every spring I lose sleep over what to plant because one side is am Sun and then the front is part sun. Anyways end up with some impatience combo. My flower boxes face the hot west sun. Early in the year wave petunias, asparagus fern, sweet potato vine, and one of those really large maroon spikes live in those boxes. Even with pinching back, my petunias look terrible by the end of July. No worries, though, as the vine and ferns take over the box, looking fat and full. I could replant but why, when the greenery will live through the end of October. Then I throw in a few fake pumpkins and call the season done. Help! I followed your recommendations to a T and my flowers are all dying! I have direct sunlight and all the flowers I got require sun. 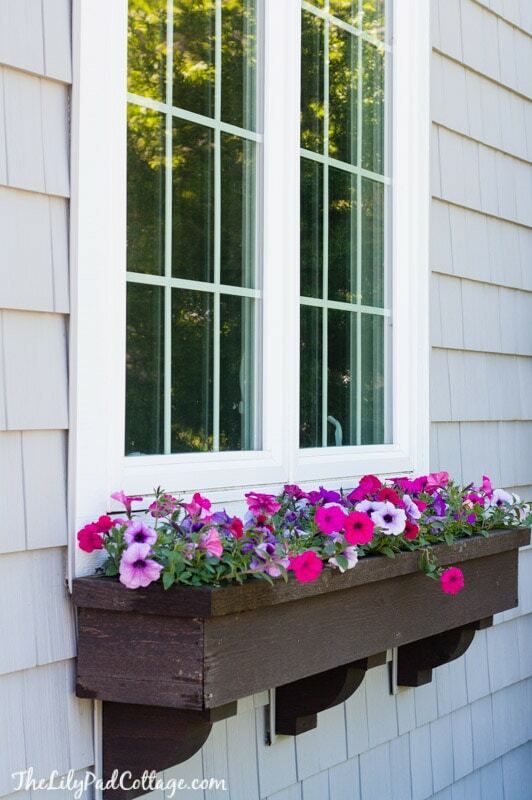 Your window box is beautiful. I purchased self watering window boxes this year from Lowes and they were a godsend! I also put mulch in the bottom to hold water in and top it with miracle grow planters mix soil. My mom always said you need a spiller, a thriller and a filler and my boxes have always been beautiful by following that advice. That does sound amazing! I was so sick of watering them by the end of this season! I think they may be verbena? I have a question: I used the Sta-Green potting soil with 9 months feeding. Do I still need to fertilize once a week? Hi everyne ! I’m writing from France, I’d like to know how many plants did you fill in your window boxes ? Here in France they tell you to plant them every 20 cms or so, but they you get skinny window boxes. I’m using very small containers (tin cans) and professionals tell me to put one planonly… Very frustrating… I’ll try one can with 2 and one can with 3, hope it works well. Thanks for your tips and congrats for your window boxes ! OH no! I haven’t had that problem, my dog keeps them away I think he barks like crazy at them! Susan, I did the gardening at a State Park and always had issues with the chipmunks & squirrels burying the nuts & corn in the flower pots. I would sprinkle cayenne pepper on the dirt between the flowers, yes you had to do again after a hard rain, but it certainly helped keep them away. Also, as long as there is no kids or pets I have used moth balls to help keep rabbits away from my ground gardens. It worked for my prize hostas, just put them under the leaves by the base of the plant. Good luck and happy gardening! I love your windowboxes! What are those lovely bright green shrubs underneath the window box? They don’t look like boxwoods. They look like they might be something in the cypress family. Did moss roses in full afternoon sun in a west facing brick shop front window box; they did very well interspersed with petunias. They were 2nd gen re-seeds so I didn’t get a chance to organize by color, but the owner was desperate for something and didn’t care. While they can be a bit messy, the spiky foliage def adds interest even when they aren’t blooming. Oh that sounds pretty! I might need to try that! Okay this is the second year I referenced this blog post (kept it saved on a Pinterest board) to do my window boxes and I finally got it right! I have two boxes on the side of my house that are full sun and last year did not fair well, so this year I went right to all petunias and they are thriving! I put a different flower in my front boxes that are only half sun, and they are just not as big and beautiful as the petunias have gotten! Both years I used the water crystals and flower food, but really it’s getting the right flower in there that makes a difference!